I've been on record previously on this site as both liking and hating Torche's sunny sludge-pop, so their newly-released fourth album presents a good opportunity for re-evaluation. Restarter lives up to its name in a surprising move from the band by not just being their first full-length with Relapse Records, but also being their heaviest album in years. Almost completely gone are the pop-punk influences of before, instead opting for a sound that breathes doom and is several shades of sludge more gritty than Mastodon have been for several albums. Opener Annihilation Affair is suffocatingly heavy, booming riffs droning out and nearly drowning out the clean singing perched precariously atop – and it's not instantaneously catchy as you'd expect, though is still surprisingly gripping. It's far closer to the standard output of previous label Hydra Head than what you'd associate with Torche, dissolving into near-psychedelic feedback towards the end as incantatory drum beats hypnotize you; the first time I heard this I had to double-check that I had the right album on! The following Bishop in Arms hints at returning to the band's usual territory, with a faster pace and more infectious melody apparent, although it's still nearly drowned beneath the rumbling heaviness of the track – think a sober High on Fire. It's first single Minions that really starts to sound like Torche, however, a slowed-down version of one of their catchier anthems that's somehow even better given space to breathe at over four minutes than it would have been as one of their previous two-minute jobs. After that, the usual speedy rush of Loose Men is a release of tension, and although subsequent songs drop to even below two minutes (Undone) you really couldn't pigeon-hole them as anything less than sludge metal. That 'thunder pop' label that the band give themselves is all but absent – plenty of thunder, but very little pop. The catchiest track present and the closest to that description, Blasted, is still heavy, but brings Japanese experimentalists Boris to mind rather than the Blink 182 of yesteryear; a compliment from anyone but especially a metal website! Some of the songwriting tropes that the band rely on are still evident – fans will be familiar with No Servants' basic structure, for example, even if they haven't heard it in this form, slower and heavier. Still, it's good to hear Torche retreating a little from the path they were previously on, headed inexorably towards the mainstream. There's even an eight-minuter in the form of the title track, their longest song in ten years, although it's very repetitive and outstays its welcome by the fifth minute – some more work is needed if the band are writing much longer songs. All things considered, it's difficult not to just call Restarter a new start for the band. I'd call it their most mature album, in fact, the band seeming to have grown up; that Restarter's artwork is the first that you wouldn't call silly speaks volumes. 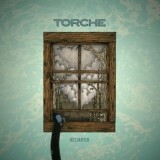 A good sludge album from a good band, Torche may disappoint those who listen to the band for its sunny lightness and poppy hooks, but the songs here are still a damn sight better-written than your average Relapse b-grade sludgemeisters, and by pumping up the heaviness Torche have proved they belong in the genre.